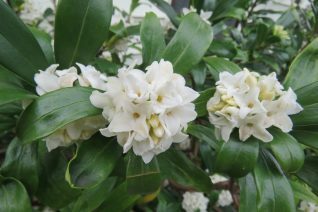 The pure white flowered form of winter Daphne that we cherish for its large,profuse clusters of flowers that are intensely fragrant of lemon from February to April. The entire leaves are deep green and lustrous. We have decided this is the most fragrant form of winter Daphne. Dome shaped dense evergreen shrub to 3′ x 4′ for part shade to shade. Amazingly tolerant and adapted to dry shade. Avoid blasting hot afternoon sun. Great on an eastern exposure. Light water to establish. Well drained average soil. Supremely deer tolerant. Formerly listed as Daphne odora var. leucanthe. Fantastic Daphne that we carry very early in the season. 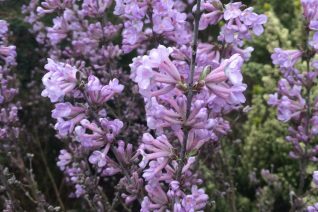 A large flowered form of this excellent deciduous shrub. To 4′ x 4′ in 5 years soft gray buds open to masses of violet blue (non-fragrant) flowers which line the stems. Simple leaves that follow have a fine fur on the surface. Blooms for an incredibly long time from late March to early May. Full sun, very well drained soil in hot sun. Little summer water when established. Fall color is light yellow. Plant with Manzanitas, Grevilleas, Ericas. Low maintenance shrub of great grace and beauty.